We've got 4 new sets and 5 plain janes releasing this Friday night, and they're sure to put a spring in your step. To celebrate, this Friday (March 5) we're having an all-day blog party right HERE on the Verve Blog. We'll be posting hourly starting at 1 PM Eastern, so save the date for a day of challenges, sneak peeks and prizes. It's been a while since our last release, so we couldn't go without a bit of a chat to catch up with all our friends! 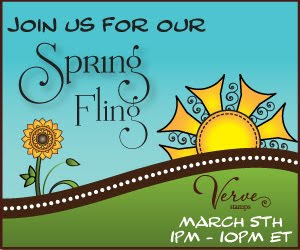 Join us on the Spring Fling Chat thread this Friday night (tonight) at 9PM Eastern for an hour of speed-reading, set reveals and gorgeous sample cards from the Divas while we countdown to the release. The Divas are stamping up a storm, and we'll be finishing off the night with a grand finale design team blog hop showcasing the new sets. The hop begins when the new sets release at 10PM Eastern, this Friday night (tonight). There'll be a chance to win our entire release, so be sure to tune in! See? I told ya'll there was much going on!! I hope to "see" ya'll real soon! I'm so excited about it...the stamps are TO DIE FOR! !